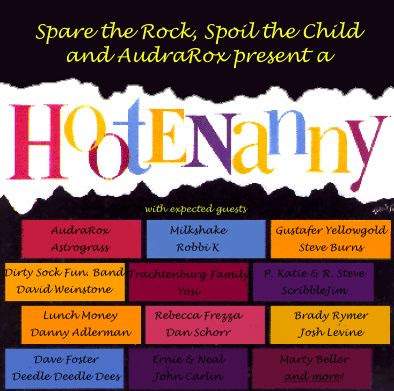 Thanks to Rebecca Frezza (or perhaps more accurately, her hubby, Bob) for these first PICs of the Brooklyn Spare the Rock/Audra Rox event! Jordan, Steve, Katie & Rebecca. 'Twas a late night for kiddies & kindie rockers at the Brooklyn recording of Spare the Rock. Lots of acts...a couple 'o dozen very talented acts crammed into the delightful Jalopy. It was great to catch up with old friends & meet new folks I've heard of or read about, & put the faces to name &/or legend. One such person was THE Lovely Mrs. Davis who only lived up to the first part of her name (lovely), but disappointingly not the second "Tells You What to Think" part. I was SO hoping to be told what to think. Although Bill did let me think I was going on at 3:00am. Left to our own thoughts & devices the crowd dined on delicious middle eastern vegetarian food (pitas, stuffed grape leaves, hummus & more) as we enjoyed each other's music. To say there were highlights would be an understatement, but to number them would be burdensome. 1) Randy Kaplan's Shampoo Me! Thanks for the humor & beautiful playin' Randy. I had to play that for my twins when I got home & they got a real good chuckle out of it. 2) Lunch Money. These folks are so cool. Love their Silly Reflection disc. Reminds me of VU, & it just makes me smile every time I hear it. 3) Scribble Jim. Sorry your kids got all tuckered out & couldn't stay. Who could blame them...(Jim went on after me & I was on at 11:30pm!) Jim's "I Love Life...I Love You" original was warm, funny, smart & then, of course, it was (electric) Chocolate Milk time. 4) Ella forgot to bring all of her teeth. There was lots & lots more really great stuff...but I leave that to the other bloggers. How did ya'll enjoy this shin dig? We can post them here. Dr.Bernie Siegel, prefers to be called Bernie, not Dr. Siegel. 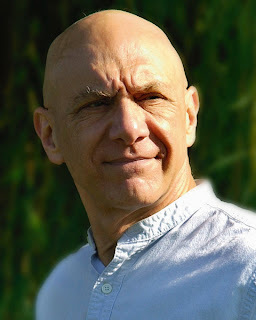 He's the author of many mind-body-spirit medicine books including the best seller, Love, Medicine & Miracles. 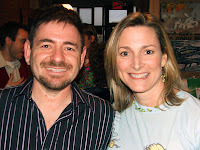 Recently his attention has shifted to parenting & children with two new books: The children's illustrated story, Smudge Bunny, as well as, Love, Magic & Mudpies, a book full of practical advice about raising your child to feel loved, be kind & make a difference. I've had the pleasure of interviewing Bernie several years ago on the radio, & I'm very pleased to have his ear (& voice) again. 1) You've written & spoke about treatment of cancer patients, as well as the science of mind-body-spirit medicine. Your two latest titles are focused on kids. What prompted this new path? I was prompted to write these because of the damage I see inflicted upon our support group members and the general population by unhealthy or abusive parenting. A loved child who has self worth and esteem uses information to care for him or herself while an unloved child does not develop a normal nervous system and becomes the addict seeking feelings never received in a healthy way and uses aggression in a violent and destructive, not constructive way such as work or sports. If every child was raised with love our planet would be free of problems in one generation. Our planetary suicidal path is an example of why we need to care for our children. We need to love the children even if we do not like what they do. And not say, "There's something wrong with you" but "I love you but I do not like what you are doing." 2) In Smudge Bunny you tell about courage & a momma bunny's advice that "some good will come of this." Are these words you grew up with? Yes, I grew up with mottoes to live by and not mottoes to die by. Remember up to the age of six a child's brain wave patterns resemble those of a hypnotized person. So the messages are embedded in the brain and hard to eliminate and abandon when one gets older and conscious of them. I heard things like ; Do what will make you happy; when decisions had to be made. When troubles occurred they were God's redirections from which something good will come and material things were to make life easier for people. Success was not about making more money but about being happy through contributing meaningfully to the welfare of the world. The unloved say they grow up with mottoes to die by because of the negative comments from their parents and other authorities. To quote one woman, "My mother's words were eating away at me and maybe gave me cancer." She has rebirthed and reparented herself due to cancer. 3) In Love, Magic & Mudpies there are short segments & practical advice about various subjects. Two of my favorite subjects were humor & dealing with "failure." What can parents do to bring more humor to their lives & change the perception of failure? Just don't let the child in you die. I am a multiple personality and the kid in me comes out all the time. Yes, I embarrass our children and grandchildren but my behavior allows them to lighten up, enjoy life and stop worrying about what everyone else thinks about them. I volunteered to serve lunch at our grandchildren's school. The first time I showed up in a rainbow colored wig and the second time with a badge and officer's cap and examined lunch boxes to be sure there were no explosives in them. Sometimes I said I had to sample the cookies and other desserts to make sure they were not contaminated. Boy, did I get a reaction. Our children often come home and thank me because when they do something silly at work or school people say, "Well you know who his father is." As I mentioned let your kids know that when they are happy they are a success. Accumulating money may get people to label your children a success but they won't be happy because of it. I meet the children of millionaires who are miserable. As one said, "My father ruined my life when I was 21. He gave me a million dollars so I had to be a success." What if he had started a charity would his father have criticized him? Our children have given money they inherited away to help their friends and others do things, like go to college, that they couldn't have afforded to do otherwise. Remind your kids to not be afraid to fail until they fail up. As the movie Harold and Maude teaches, "Reach out, take a chance, get hurt even, play as well as you can. Go team go. Give me an L, give me an I, give me a V, give me an E, LIVE. Otherwise you've got nothing to talk about in the locker room." Tell them to follow their hearts and do not impose upon them the profession or life you would choose and cause them to lose their life. 4) Parents & families are very busy these days. There seems to be little quality time with the kids. What are your prescriptions for living fully as a family? Make time. When our children complained about my being on call as a doctor when other dads weren't I reminded them they went out evenings I was home to do things they enjoyed. So we each have the right to do what makes us happy and we also set evenings aside to do things as a family. I always enjoyed our roller skating night. Vacations also were special as we went to stay on farms, or a weekend in a New York hotel and other places where we could enjoy things together from museums to horse back rides. Also you can take one child at a time for a special treat with their parents when it is their birthday month. As a gentleman with cancer learned, remember we are all here for a limited amount of time, and when you accept that fact you realize time isn't money it is everything and spend more time with the people you love and less with the people you don't live or who don't love you. My new word is "liove." Live and love and teach that to your children. 5) Will you be making appearances & speaking about the subject of parenting & families? If so, is there a schedule? I go where ever I am invited. My web site has my speaking schedule. Most of the events are health oriented and not exclusively about parenting. I also write articles and speak at many schools in our area. If you go to http://www.berniesiegelmd.com/ and click on the ECaP (exceptional cancer patients) symbol you will go to cite where my speaking schedule is listed and people can email me through the first web site too. 6) Thank you for your time, Bernie. (I want the reader to know that you want folks to address you by your first name, & I find that warm & welcoming.) Are there new books you are working on, or another future project you can let us in on? I am always writing to share meaningful aspects of life. Getting things published is the hard part. I want people to know how their body speaks to them through their dreams and drawings and feelings. Also help children and adults deal with loss and death and understand the nature of life and that a perfect world is meaningless. If every parent were perfect and every child loved and life free of troubles we would all go nuts and our actions would mean nothing. So get out in the world and reparent the wounded. You can become a CD or CM; or Chosen Dad and Chosen Mom and save a suicidal's child through your love. I know this from experience. When the child is inspired the information becomes useful and meaningful. Self destruction is not caused by ignorance. Is your old Haggadah getting a bit stale? Ours is so archaic we need a ye olde dictionary. My mouth gets so exhausted reading aloud all the "thoust" & shouldst" that I can barely chomp on my Haroset...(somehow I manage). 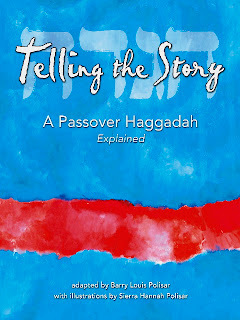 Barry Louis Polisar has re-told the Passover story in this brand new Haggadah that not only tells the story, but gives the background on the spiritual origins of the holiday traditions. Explaining each ritual in a simple and straight-forward way, this Haggadah includes both the English, Hebrew and phonetic pronunciations of the holiday prayers, so that everyone gathered around the table can participate in the Seder; a welcoming and inclusive adaptation that captures the spirit of the holiday without compromising tradition. This book features original full-color illustrations by Barry's daughter, Sierra. 1) How did the candy band form? THE BAND FORMED AFTER I HAD MY SECOND CHILD AND REALIZED THAT KIDS MUSIC JUST DIDN'T ROCK - I WANTED TO DO SOMETHING ABOUT IT. SO I FOUND SOME OTHER STAY AT HOME MOMS THAT FELT THE SAME WAY. I ALSO THOUGHT IT WOULD BE FUN PLAYDATES FOR THE KIDS - YA KNOW - BAND PRACTICE, SNACKS AND SIPPY CUPS!! 2) How do kids respond to punk? Do the younger ones get scared or feel it's too loud? THE KIDS LOVE LOUD! PROBABLY ONE OUT OF 100 WILL PLUG THEIR EARS - BUT I THINK THOSE ARE THE KIDS THAT DON'T LIKE LOUD ANYTHING. 3) You covered Raffi's "Down By The Bay" in punk fashion. Of all kids songs why that one? IT IS HAS A CLASSIC PUNK VIBE!! 4) What are your musical influences? 5) How often do you perform & where? WE SOMETIMES PERFORM 2-3 TIMES PER WEEK, ESPECIALLY IN THE SUMMER. WE PLAY LIBRARIES, SCHOOLS, MUSEUMS, OUTDOOR CONCERTS IN THE PARK, LOLLAPALOOZA, BARS, FESTIVALS AND FAIRS. 6) How are folks reacting to your Clash (Elvis Presley) album cover redo? EVERYONE LOVES IT SO FAR. PEOPLE ARE SAYING THIS IS OUR BEST CD YET. 7) Are you moms? What do you do when not playing in the band? WE ARE ALL MOMS. STARBURST (TAMMY) IS A PILATES AND AEROBICS INSTRUCTOR, SKITTLES (DANIELA) HELPS HER HUSBAND RUN HIS TRUCKING BUSINESS AND WORKS SOMETIMES AT A CANDLE MAKING SHOP, ALMOND JOY (PAULA - ME) TEACHES GUITAR LESSONS, AND KIT KAT (ANITA) IS A YOGA ENTHUSIAST. 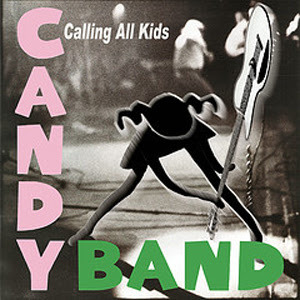 8) What's next for the Candy Band? MORE RECORDS AND MORE CONCERTS!! !